I spent the day fighting off a tidal wave of paperwork–Argh! The good news….now I can Quilt without Guilt! Fortunately, we don’t have to look far to find quilting inspiration these days– The Fall colors are peak here in Minnesota and we’ve had some sunny skies to accompany the glorious color. The Oak Leaf, like most nature motifs, is very forgiving. 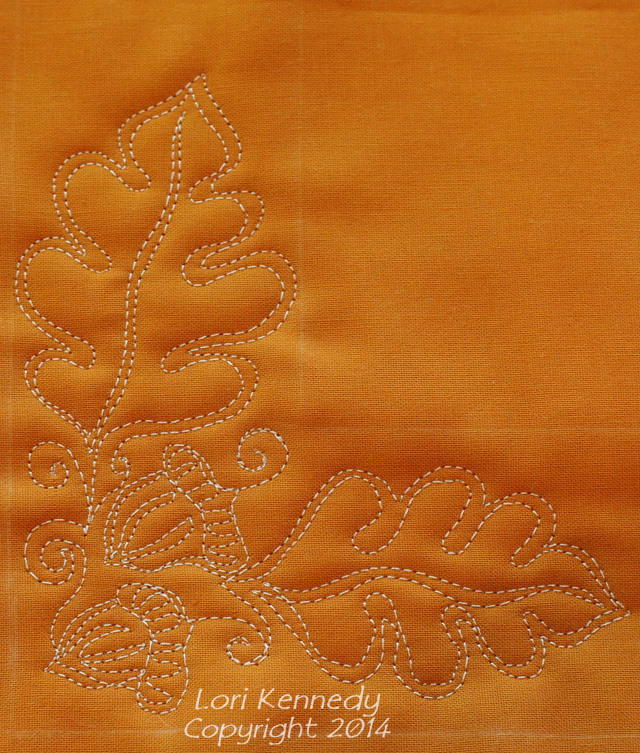 Most lines in nature are not perfect nor perfectly symmetrical, so even if your stitching is off a bit, The Oak Leaf will still look fabulous (I promise!). 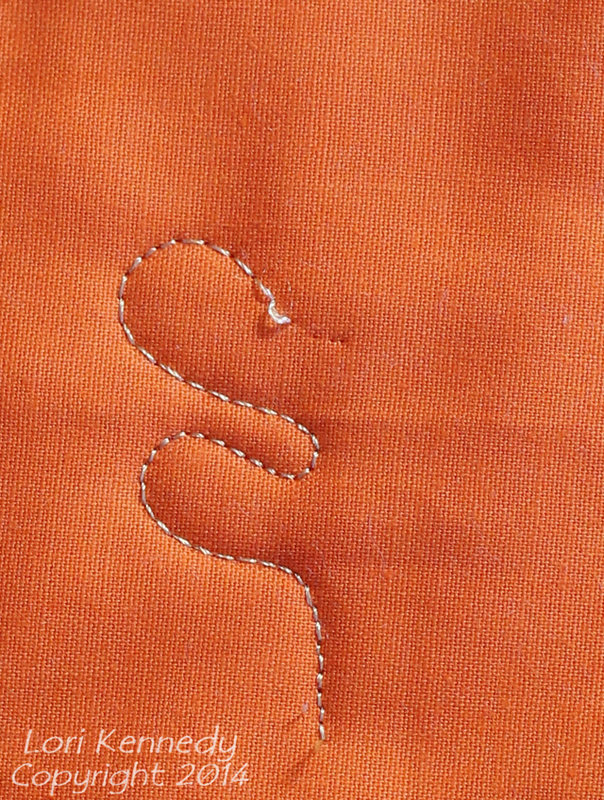 Begin stitching a short stem. Then add curved petal, followed by a larger curved petal. On the top, add a flame-shape. Repeat the shapes on the other side. Don’t worry about perfect mirror images…anything close will look great. 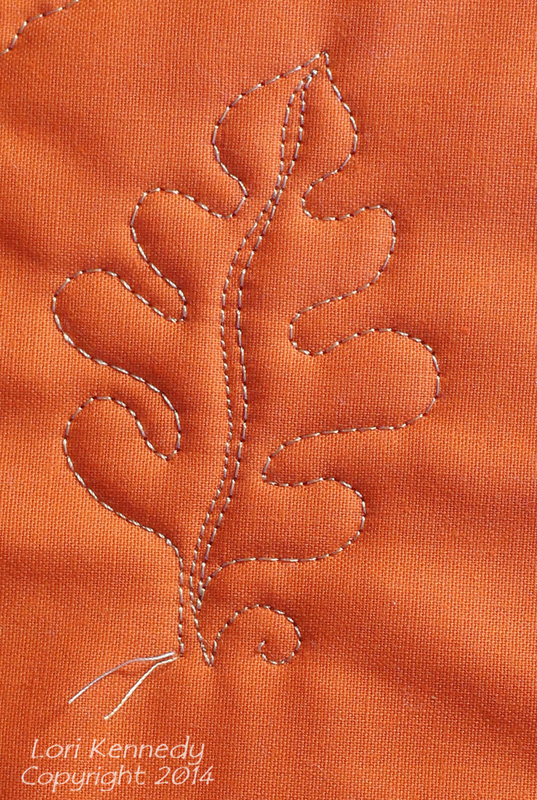 Stitch a curvy stem through the middle of the leaf and echo stitch back out of the bottom of the leaf. Add a small curl to serve as the top of the acorn. 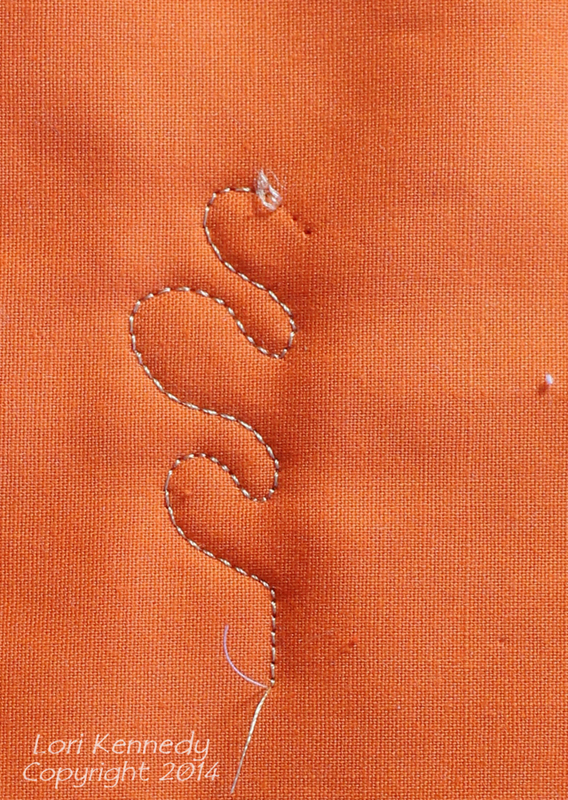 Stitch out of the curl and then stitch a bean-shape with a point at the top. 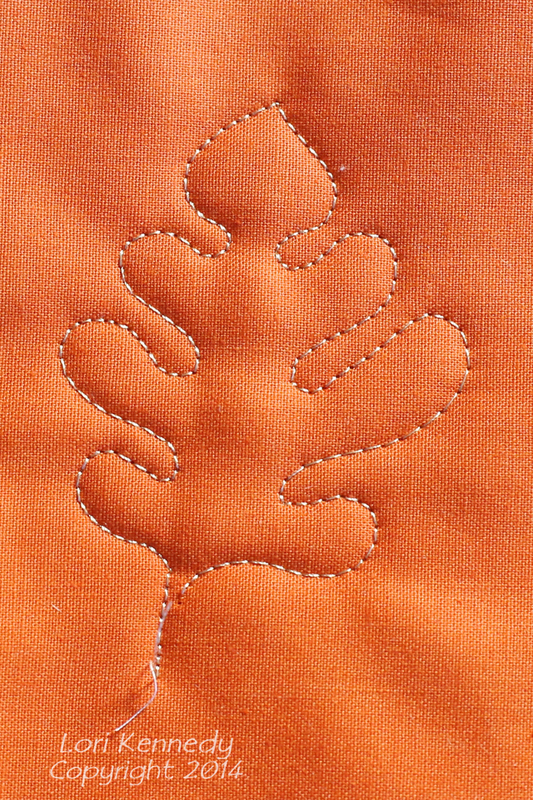 The acorn: bean shape with a point at the top…then echo stitch over the left side of the cap of the acorn. Stitch a wavy line inside the cap of the acorn from left to right. Finally, stitch down to a point and back up to the cap. If you like, add a few contour lines inside The Acorn– though it is not necessary. 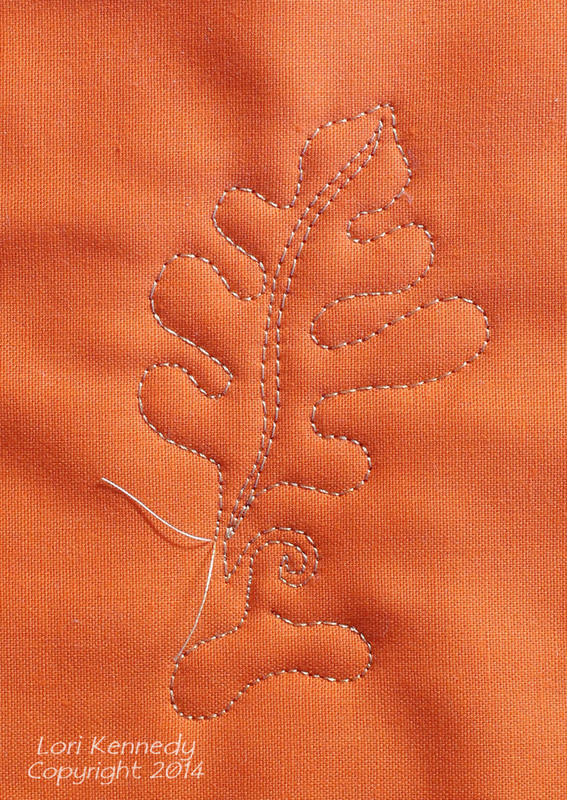 Also, echo-stitching around each Oak Leaf gives the pattern a little more “oomph”–for lack of a better word. 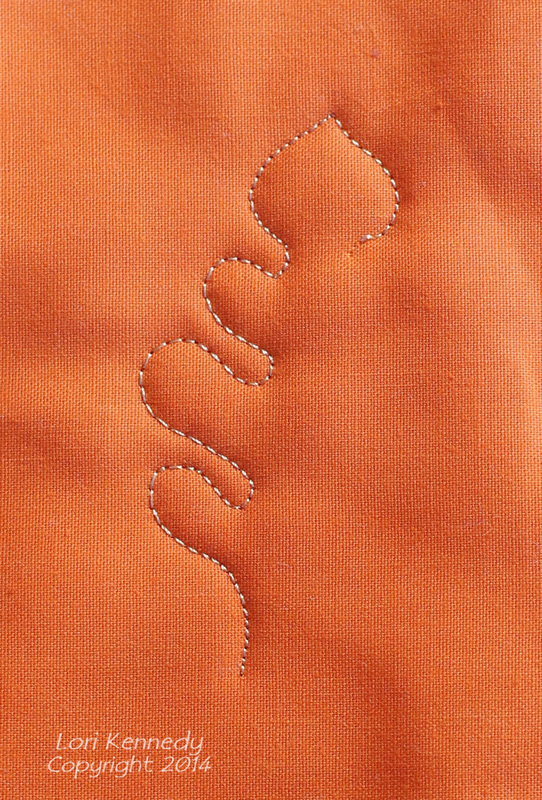 This pattern can be use as a border or as an overall fill pattern. 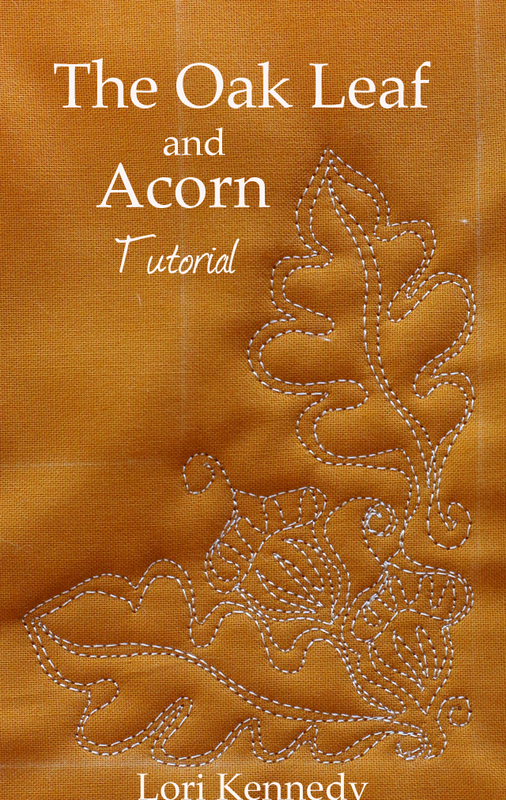 I am working on a small quilt using The Oak Leaf and Acorn and should have it ready for you to see next week. In the mean time, give this pattern a try on YOUR next quilt–no need to squirrel it away–there’s plenty more tutorials coming every week! For some colorful inspiration and a photography trick for great tree photos, you might also like The Glorious Colors of Autum. PS…All tutorials, images and information are the property of Lori Kennedy at The Inbox Jaunt and are intended for personal use only. Feel free to re-blog, Pin, share with attribution to The Inbox Jaunt. For all other purposes, please contact me at lckennedy@hotmail.com. Thanks! You have such control! it is lovely. I don’t know how you come up with all these wonderful designs but don’t stop! This is fantastic. I love all your designs. Lovely for a table cloth w/ matching napkins… wouldn’t you be the talk of Thanksgiving giving the old bird a back seat! Oh, this is G-O-R-G-E-O-U-S! I have so many potential projects (that are just ideas floating in my head, not even UFOs) that this would be spectacular on. Can’t wait to see your small quilt! Very good idea. My plan was to change the header every month. Thanks for reminding me! I love the acorn theme anyway and have some in my house but this took my breath away!! It is so inspiring and just plain lovely! I use that word too much I guess, but it is exactly what I see…loveliness!! More:..it is exactly what I needed for the table centerpieces I am making for my card-playing friends..I will try it. Thanks Lori..! OH..forgot to say I bought the last two of those lights at Lowes…love them and used both all weekend! Going back for more as a friend just complained about lighting! Christmas present score for her!! and getting a couple more for my girls stocking stuffers…thanks for sharing! What a delightful motif, Lori!! Oak leaves are my favorites!! Lovely! Your timing is perfect, and the Autumn leaves peak. 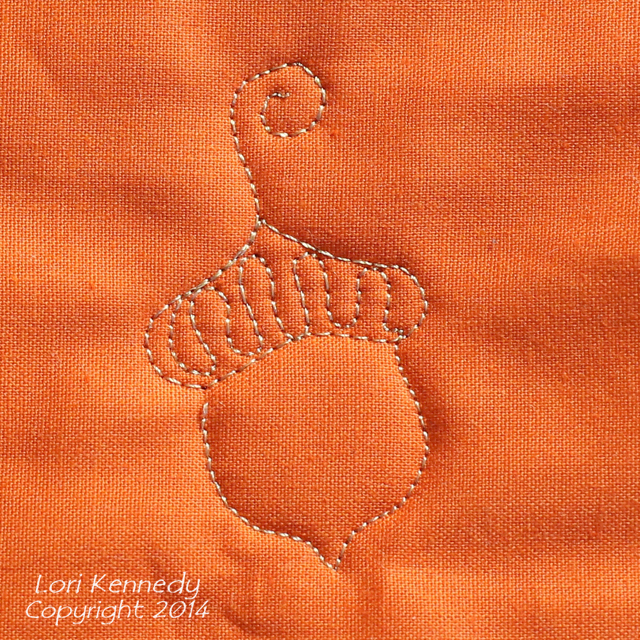 This is one of my favorite motifs whether in quilting , embroidery, felt work etc. Thanks for sharing this. That’s just darling. I can’t wait to give it a try!! Beautiful!!! Just the thing I was looking for!! Thanks so much for sharing all of your marvellous ideas! Just wanted you to know, I have you on my blog list and check your page just about every time you post something new. I love the step my step procedure you show when explaining the free motion designs. I also dabble in photography as you do and enJOY those posts as well. I don’t presently have time to do crafts due to family illness, but I am saving your webpages to a folder on my computer to refer to in the future. I pin pages mostly to share your work with others. Keep up the great work! Awesome! 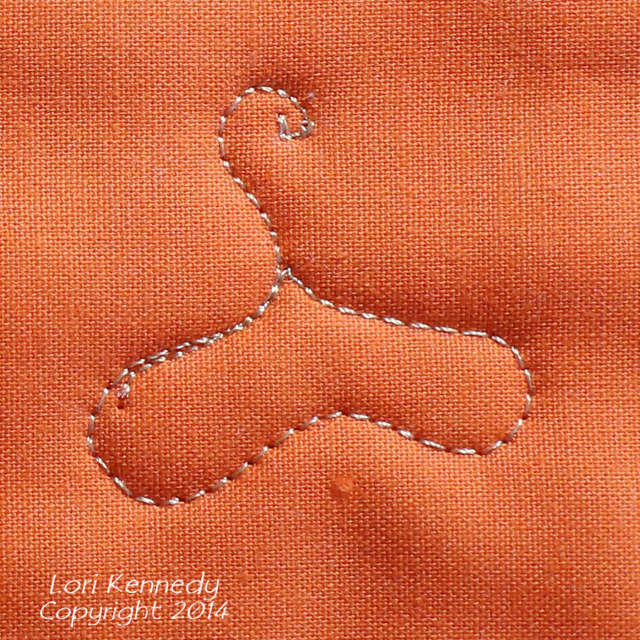 Yet another fantastic FMQ tutorial, Lori! You are like a font of inspiration that never dries up. I can’t wait to see what you come up with next! I live on Oak Street – guess I really need to try this one, but I must say it looks a bit intimidating! Sue, Just work step by step. This pattern is very forgiving. I PROMISE! YOU can do it! 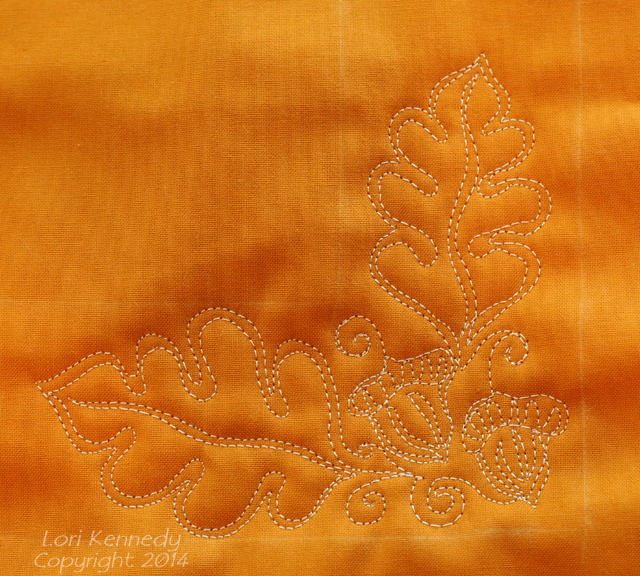 I gave this oak leaf and acorn motif a try… and posted the photo in Lori’s Flickr link on the right side of this web page. — It’s the gray Seminole place mat. I take my Tablet right up to my sewing machine and sew with it right in front of me, scrolling down through the tutorial for each instructional step. 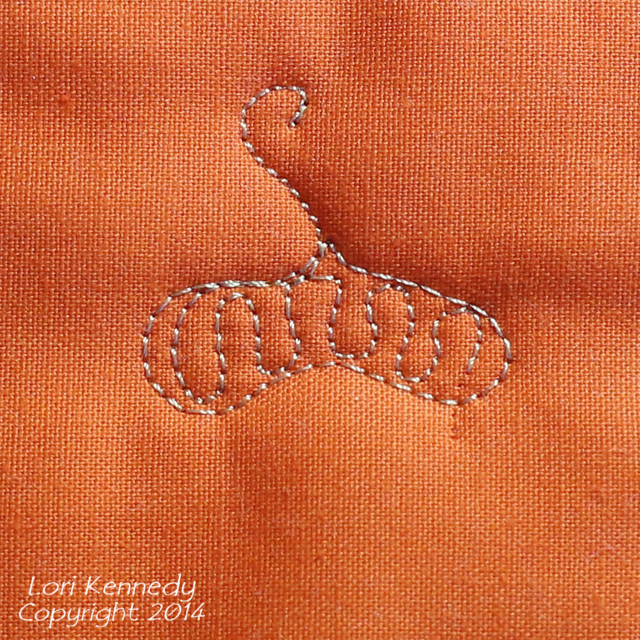 Sometimes I have to turn the tablet upside down so the tutorial is in the same direction as what I’m stitching. Thanks Peggy. Can’t wait to see it! What a great design, perfect for fall (my favorite time of year). This one is so lovely! Hey, Lori – I’m sorry if you’ve talked about this already. What machine do you work on? Do you use a stitch regulator? I keep wondering if I want to try one, but I’ve heard some people complain about it reducing visibility while you’re working?